One of my hobby new year resolution is to play more often and regularly at a local store. Fortunately for me, there is a weekly Kings of Monday gaming night and I really wanted to attend as I have missed quite many gaming nights so far. 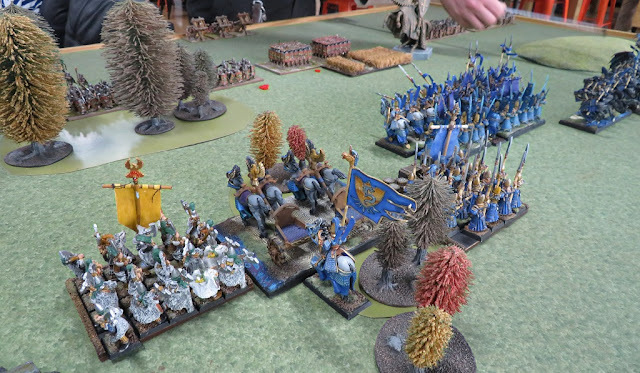 My challenge for a battle was quickly accepted and the second game of the year 2018 and the first one with the real miniatures was against Romans commanded by Tribune Glen! Glen plays with heavy infantry army of Romans and I had an opportunity to play against him once before. 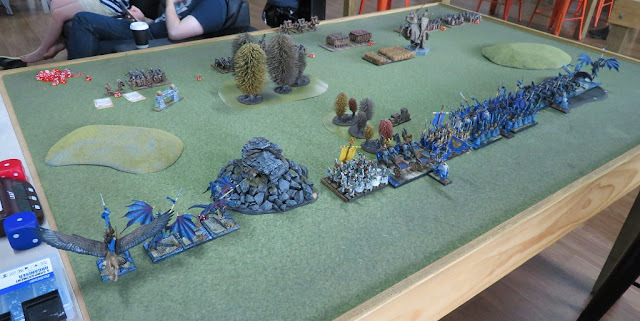 It was thus great to have a rematch and this time he brought a bit of a different version of the army, this time built around four hordes of Heavy Warriors. The main difference in comparison to the previous army is that all the infantry units are Heavy Warriors with Crushing Strength(1), hitting on 3+ in melee but having Defense 4+. However, that is upgraded to 6+ versus shooting. It means that the army has the same high resilience against shooting, is a bit more vulnerable in melee but has more staying power due to more Horde formations and hits back harder. Which, I think, is a good change because the infantry base army may be in position to counter charge more often than executing the attack first. There are also fewer war engines as Glen decided to bring only his catapults. 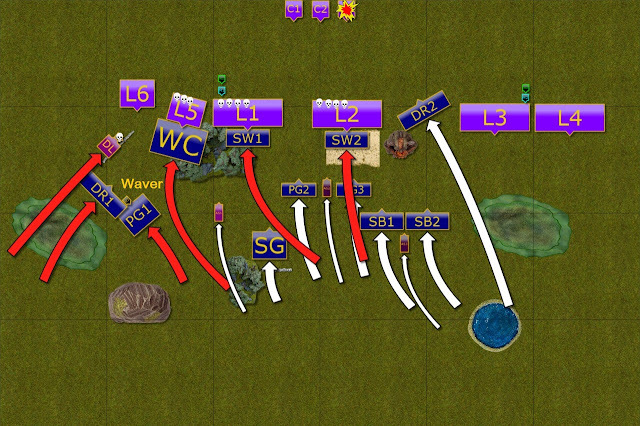 It poses a very big threat for my units as they can easily destroy one unit each. One of the priorities was thus to try and reach them, either with fast units or with shooting and try to limit their impact on the battle. The officers corp was also a bit different. This time two heroes joined the army in order to intercept any nasty fliers and pin them down, at least for a while. Two pairs of musician-army standard were there as usual to provide morale boost and ever so important re-rolls to the nerve checks. 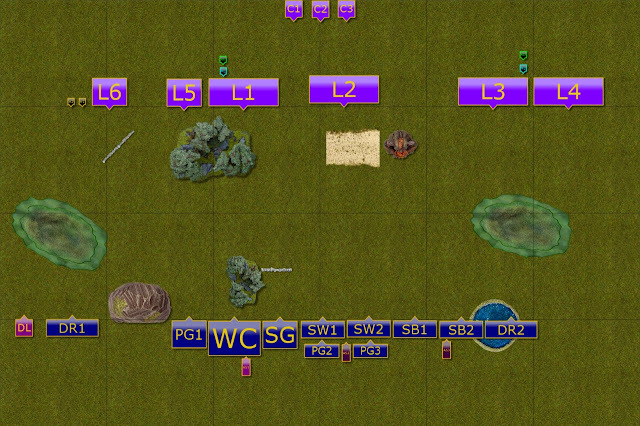 In general, kind of similarly as in our first game, I had to come up with a plan to divide and surround these well protected formations. My own shooting is not strong enough to dent Romans infantry armor so I had to rely on speed and maneuverability to execute some multi charges and to create gaps in the enemy formation. Deployment as seen from the right flank. We rolled for maps and scenario using always useful Epic Dwarf website and got Invade as a scenario. It added a new element to the challenge as each horde brings Unit Strength 3. 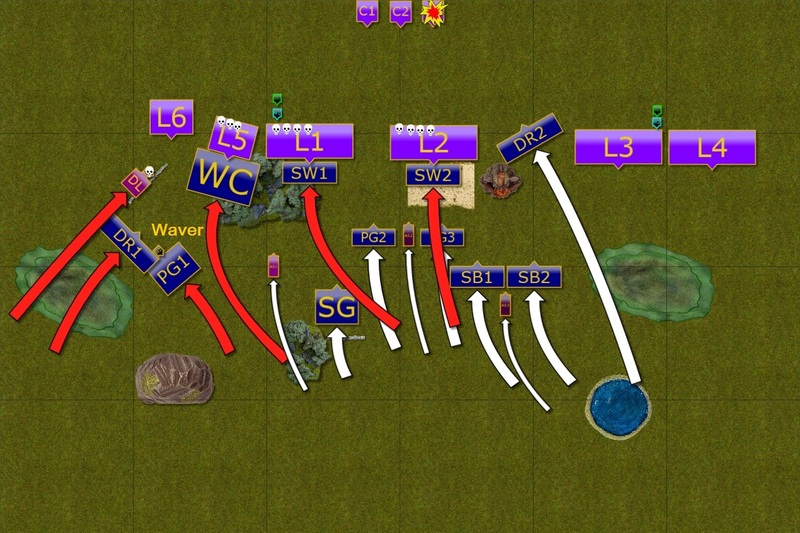 In order to balance any formation like that I need to bring either 3 troops of my own or 1 troop and 1 regiment to the enemy half of the battle field. 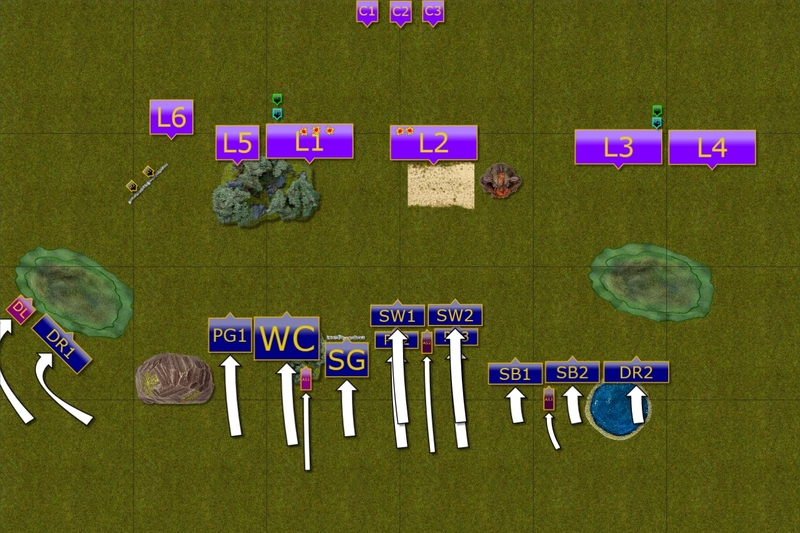 In general, Glen had a total of 20 Unit Strength that he would be pushing towards my side and I could respond with 5 regiments, 6 troops and 1 Hero (large cavalry) for a total of 17 Unit Strength. In terms of numbers that puts me at a disadvantage and dictates the approach where I simply must destroy some of the opponent's units in order to win the scenario. Seeing that the catapults are deployed at the back of the battle field I decided to use two options at the same time in order to deal with this threat. 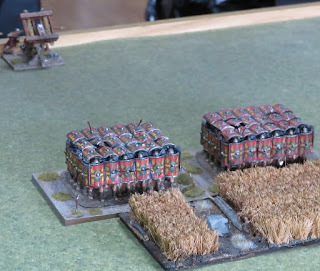 First, I wanted to use my own shooters, mainly Silver Breeze cavalry, as mobile platform to shoot at the catapults above the heads of the infantry. The catapults do not have great nerve and it seemed they were not supported by any of the heroes. I hoped I would be able to force some nerve checks before I could get one of the drakon units or the lord behind the enemy lines and engage the war engines battery in melee. It was clear that I will not be able to simply slow down the Romans and that they would move towards my half slowly but steadily. 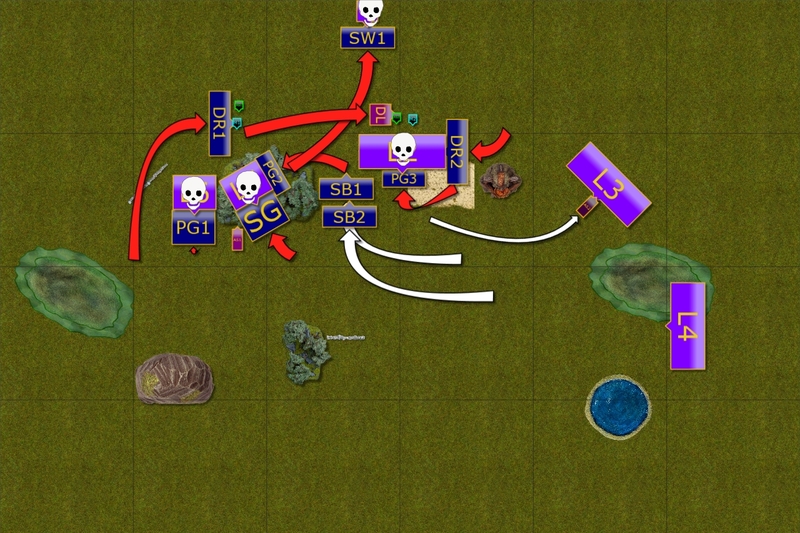 I had to break that formation and to isolate some of the units so that I could attack and destroy them. 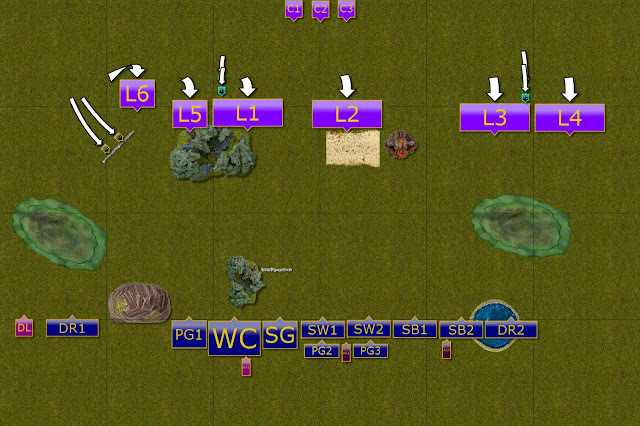 But also to create gaps through which I could move my own units to the enemy zone. Because there was no clear way to charge the Romans anyway I decided to support Storm Wind with the second line of Palace Guard. First, that would allow small infantry troops to be protected from the catapults and second, would provide a follow up to any attack the knights would initiate. I knew I could not engage Romans over entire line so I wanted to focus on my left flank with the units on the right creating a diversion and slow down the advance of the two hordes that were positioned there. We rolled for the first turn and Glen won it. He decided to take it as it allowed him to shoot at my units right from the start! Two hordes would march on the opposite flank. Slow advance of the Roman army. Entire Roman battle line moved forward, maintaining slow but steady pace. 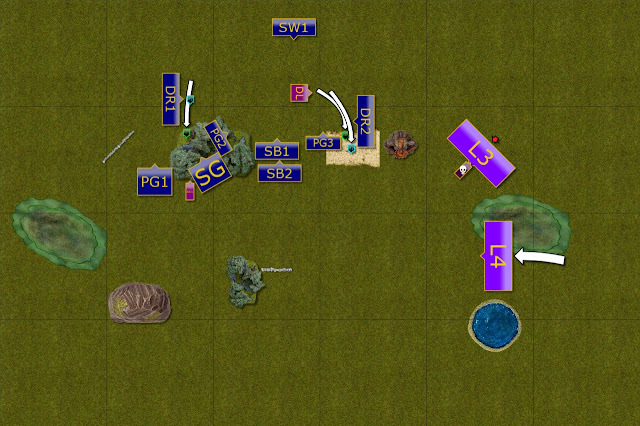 Only the heroes on the left flank moved forward at a double to get into protective position of the nearby wall. 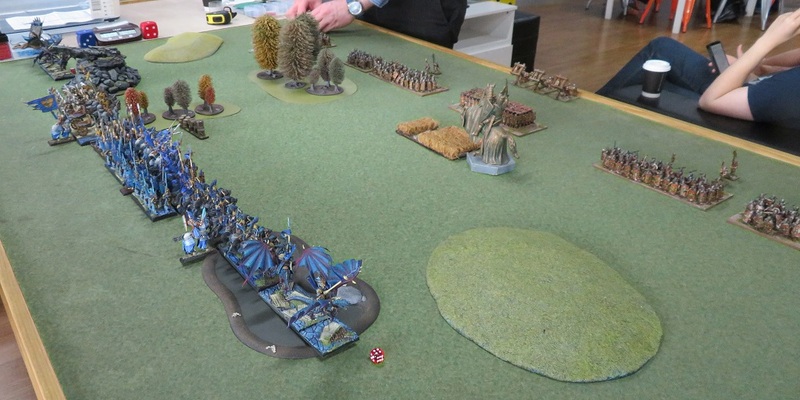 The catapults aimed at the light cavalry of the Elven force but missed. Drakons maneuver on the left flank. Tight formation in the center. Elves close the distance to the enemy a bit faster. Elves did not try to hide from their enemies and moved forward, even at a faster pace than the Romans. 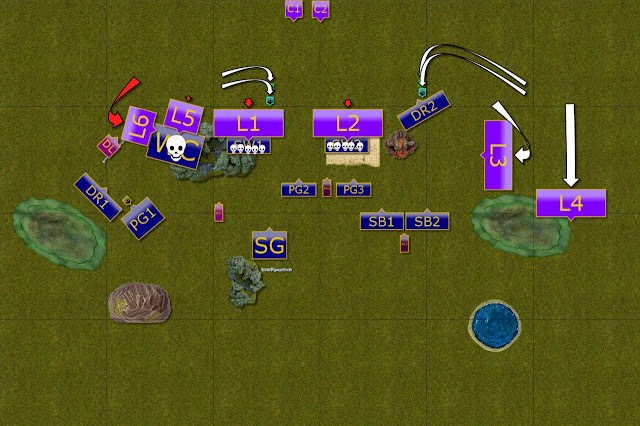 However, the main target for the shooters was still beyond the effective range and they aimed at the heavy infantry in the center, scoring some hits too! View from the left flank. View from the right flank. At this stage the Roman officers ordered their units to stop as they did not want to get encircled by the enemy. It also gave the chance to entrench in defensive positions. The catapults aimed at the enemy units again and yet again they failed to score a single hit! First wave of charges on the left and in the middle of the battle field. The right flank is not disturbed at all. Elves decided on a bold and aggressive gamble. 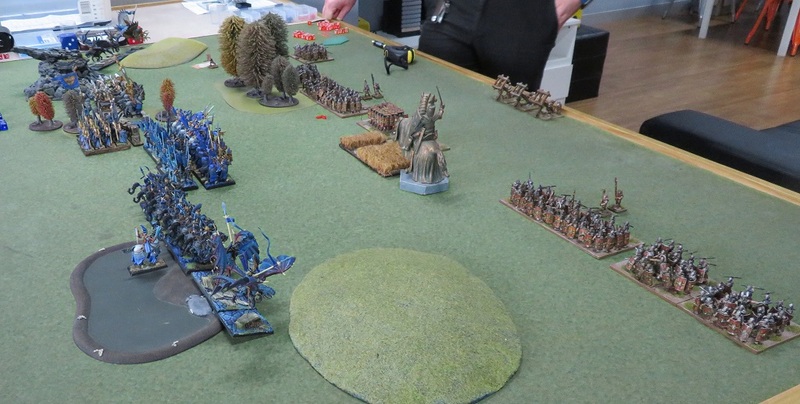 The Roman units on the right flank were a bit too far to support the center so Elves attacked on the left and through the middle with the first wave of cavalry charges. 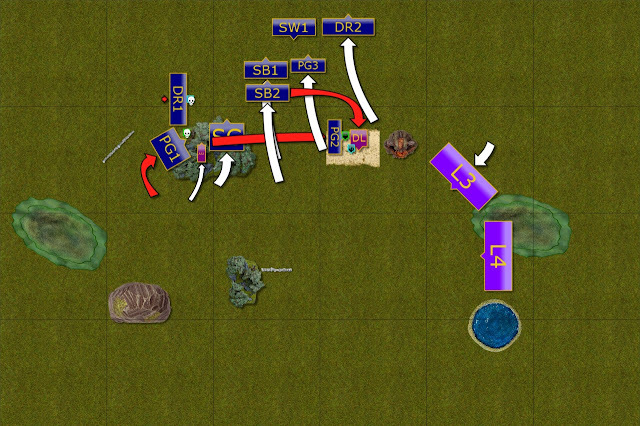 The plan was to stop the enemy units in their half and force them to attack back. 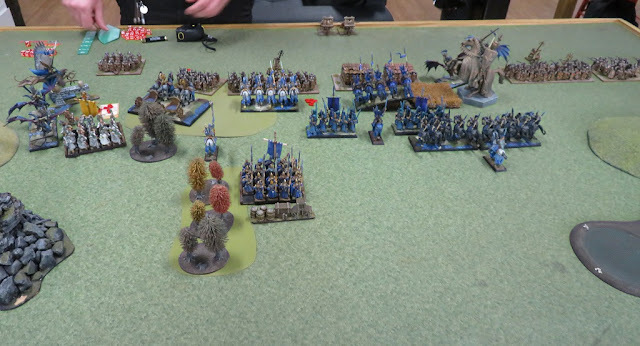 In the meantime, the second wave of the units in the form of Palace Guard approached to follow up with the charges and hopefully break one of the hordes, creating a gap in the battle line. 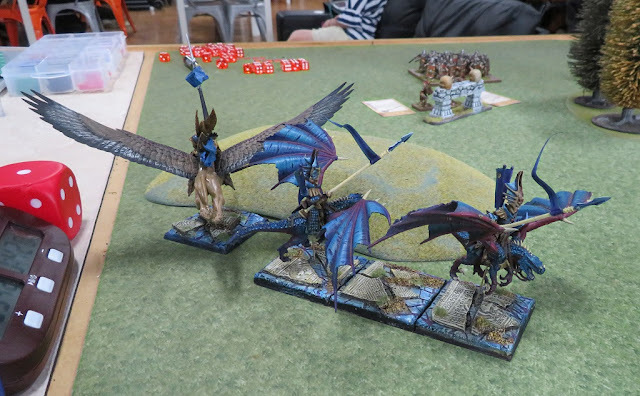 On the left flank, the exposed heroes were intercepted, one of them defeated by the Drakon Lord himself and second one stunned and unconscious. On the middle right the Drakons found the spot to land and to threaten either the catapults or the flank of the infantry horde. In addition, the fast cavalry managed to silence one of the war engines with a few well placed shots. Main attack goes through the middle. Counter attack is not as successful as planned. Roman Legionaries counter attack wherever it is possible. 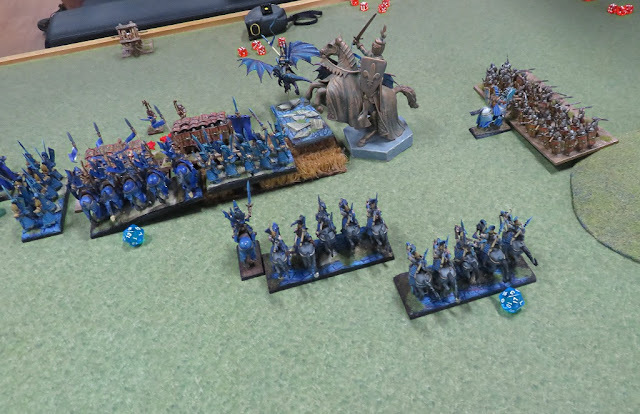 The regiments on the left flank rout the Elven Chariots but two horde formations, surprisingly, cannot even waver Elven knights! That is really bad for the Romans as these units will participate in the following engagements and allows new units to pick exposed flanks. One of the horde formations is destroyed in the forest. The one in the middle keeps fighting. 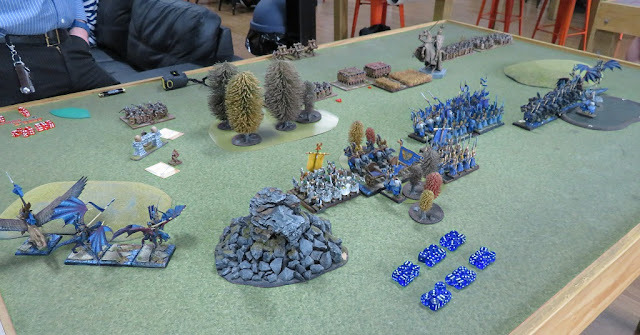 In the confusion of the melee some of the Roman units did not maintain perfect cohesion of their battle line and Elves quickly exploited that. 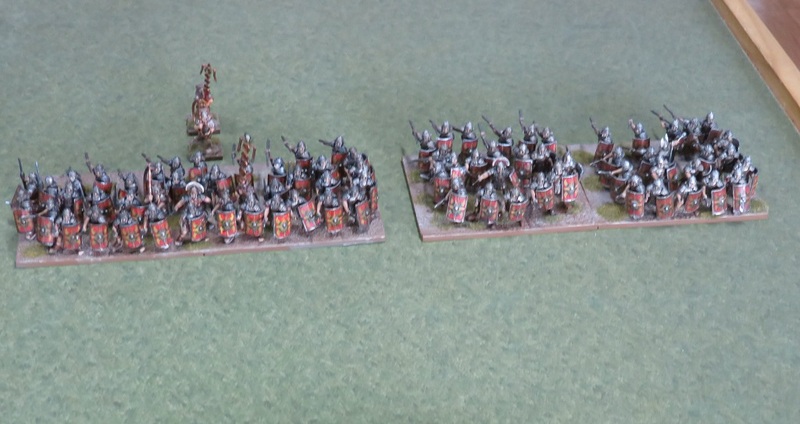 First, Palace Guard on the left flank managed to attack exposed side of the Roman regiment but they managed to hold (although got wavered). 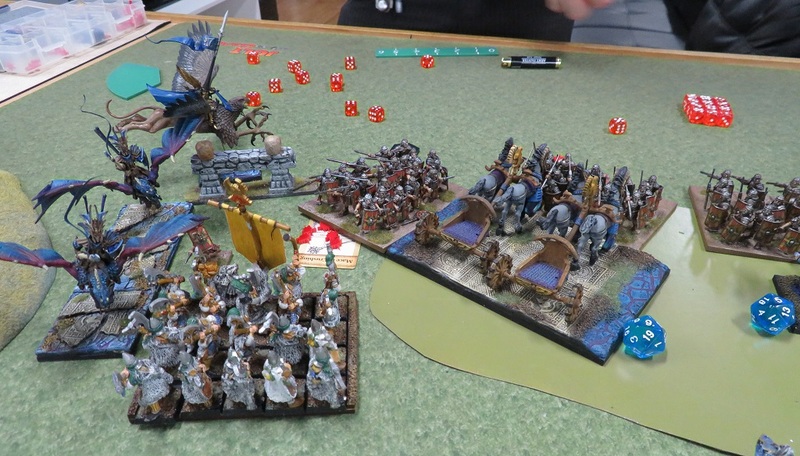 Then the Drako Lord joined the Storm Wind and Palace Guard troops in a fight against one of the horde formations. This fight ended in Elven victory as the unit was routed and the big gap in Romans line was created. 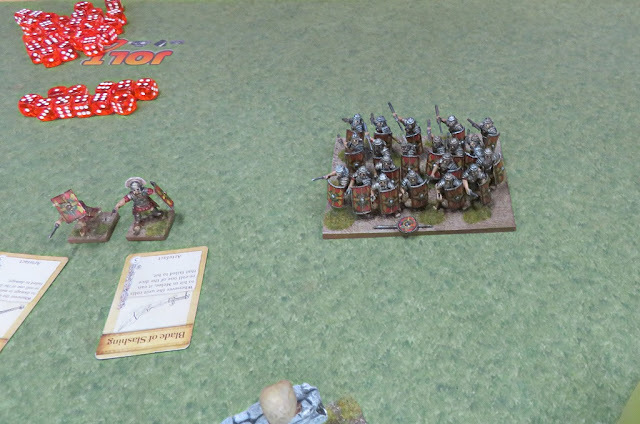 The second horde face similar challenge but they managed to hold for now and would be able to counter attack. Unfortunately for Romans, one more catapult was destroyed with shooting and the reinforcements from the right flank were slowed down. At this stage the Romans are hard pressed and have to fight many individual combats. 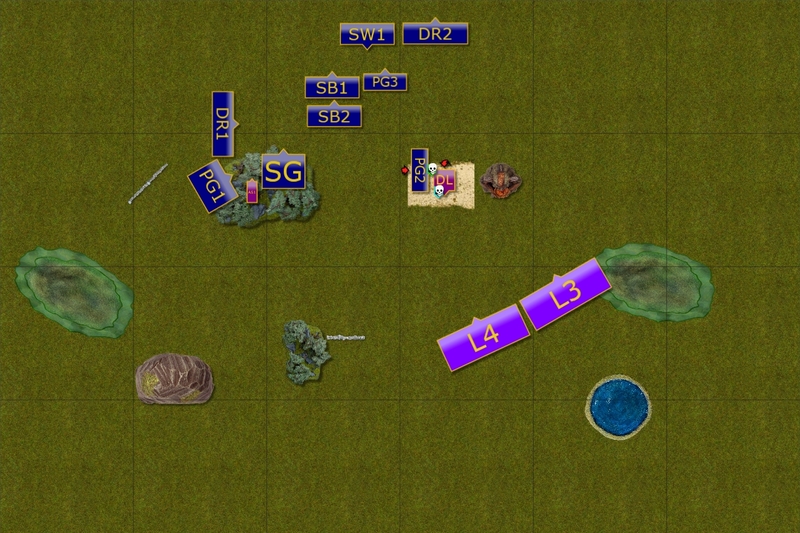 Regiments on the left maneuver in the forest but are not yet able to attack the Elves and have to brace for impact instead. 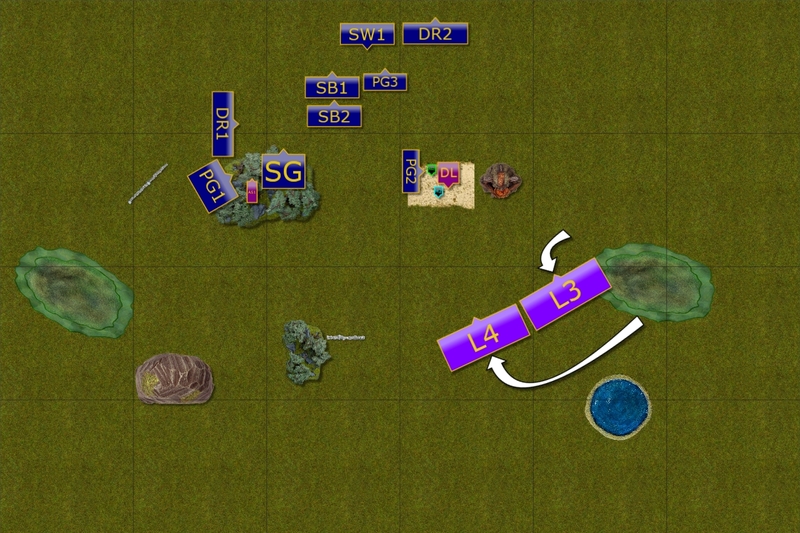 The horde formation in the forest finally destroys the cavalry but due to very close proximity of the enemy units is unable to reform to protect its flanks. Massive breach through Roman formation. 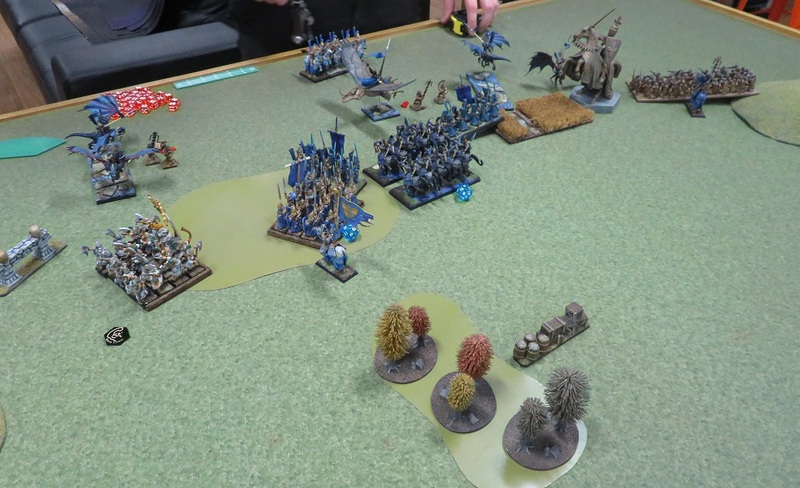 Elves gain a huge advantage. Elves continued with their attacks and this time managed to inflict the most substantial damage to their adversaries. Two regiments, one horde and one war engine perished in the numerous, well coordinated attacks at already badly hurt units. 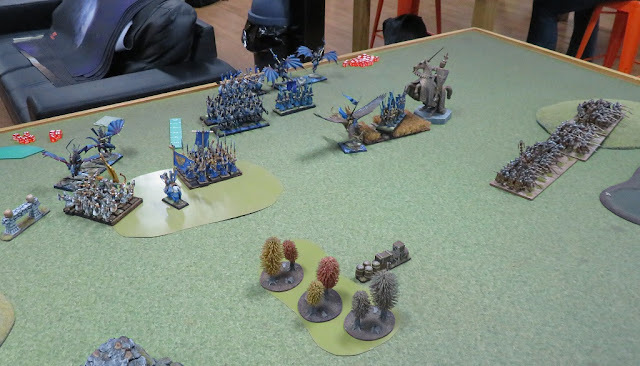 At the same time the remaining two horde formations were simply too far away to even engage Elven units. Romans march toward enemy zone. Roman Heroes try to avoid enemy troops. With majority of the army gone there was little Romans could do. 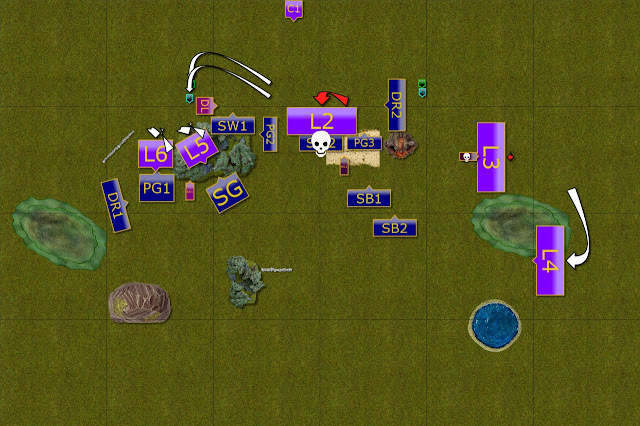 They moved their remaining units toward enemy zone and their heroes mounted a desperate escape. Elves focus on catching escaping heroes. Some of them are captured. 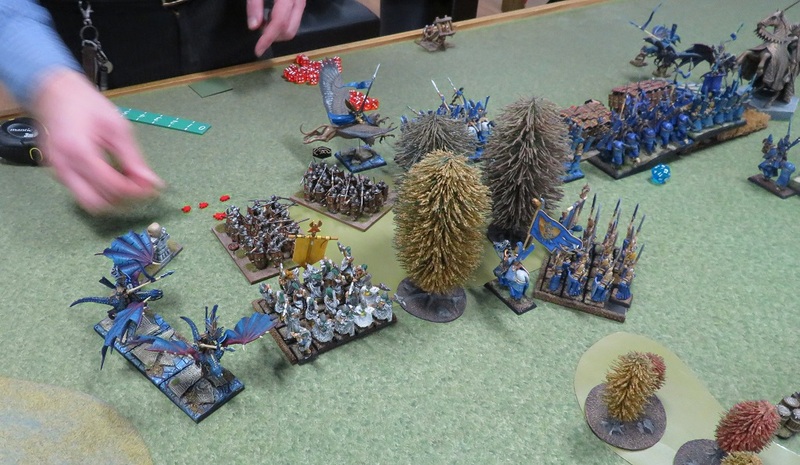 Elven commanders decided it is too risky and too late to try and coordinate another attack at fresh enemy units. The strategic goals were achieved and Elven army successfully invaded enemy territory. Hence, Elven units captured fleeing heroes and moved further away from the Roman units. Romans form new battle line. Romans heroes could not avoid the captivity but the units formed new formation, ready for the last stand. After the last heroes were captured, Elven army withdrew from the battle field, leaving two enemy units alone. There was no need for any more blood shed that day. Many thanks to Glen for a great game and maintaining high spirits despite bad luck with the catapults (not a single hit with 9 attempts in the game!) 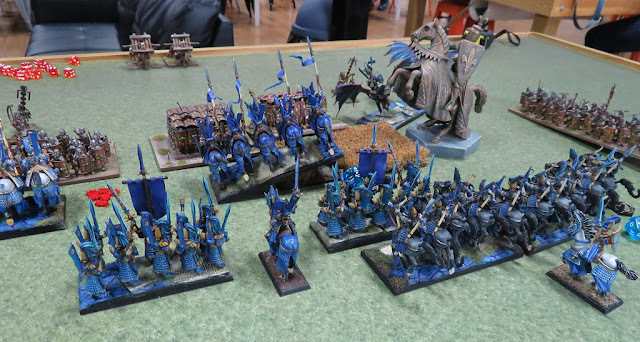 and counter charging legions that failed to even waver my knights. 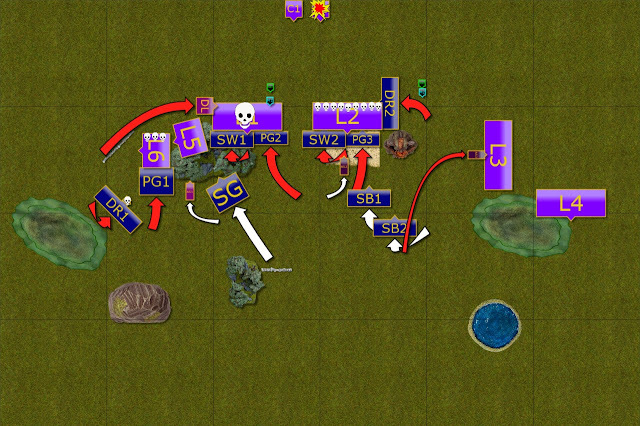 In addition, a few small openings resulted in quite dramatic consequences where his units could be attacked from the flanks. Without it we may have ended up in a war of attrition where Roman units could start winning. Hence, I am glad I managed to spot these openings and that the plan worked. I hope that one day I would be able to bring my own historical army so that we could have a game in such settings too. That would be very interesting game as breaking through these heavy warriors is not as easy as one may think! Wow that was well executed! Being able to hit flanks is really the most important goal for an MSU force since a small number of attacks can rarely do much in the front. You did a great job forcing the line of engagement far enough forward to make crossing the halfway mark very difficult. Even if your initial engagement units were routed, you could have continued to threaten and stall with the rest of your force. Invade is one of my favorite scenarios as it allows for some very creative options and usually leads to fun, memorable games!